Tyre distributor Micheldever, in partnership with Falken Tyre Europe, have announced the result of their nationwide competition to win a Volkswagen up!. Thomas Clarke from the Forest of Dean, Gloucestershire, is the lucky winner to drive into 2014 in the brand new car. 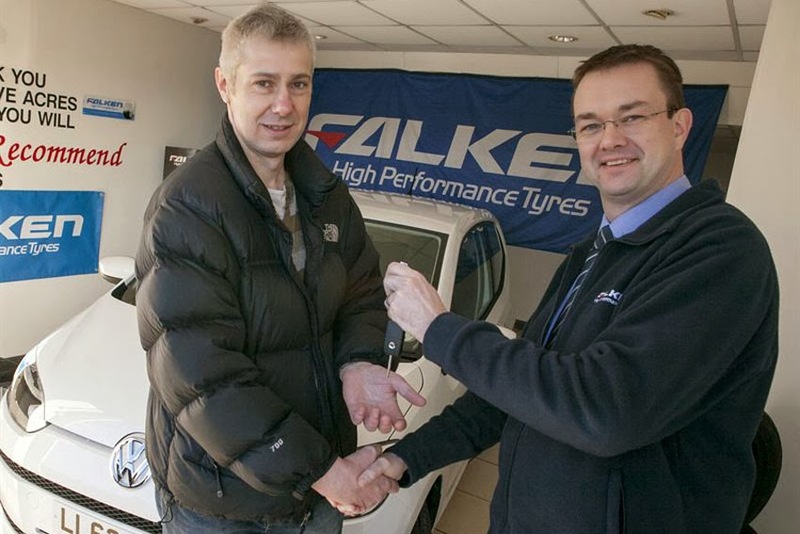 He entered the competition whilst buying some tyres from the Coleford five-acres garage in November. "I always like to support my local businesses, so when Fives Acres recommended the Falken tyres, I was more than happy to go with their suggestion. Afterwards, when I saw the competition flyer on the desk, I thought I may as well enter it - but you never expect to win something like that!" said Clarke. The competition ran across the country during October and November, with entrants scanning a QR code or texting a competition hotline when they purchased the tyres. "When I got the call from an unidentified number, I thought 'here we go' another PPI call or someone trying to sell me something," he further added. "I waited for the automated voice, so when a real person told me I had won the competition I really couldn't believe it! It's the biggest prize I've ever won. It comes at the end of a really difficult year for me, so to win it is a real boost and icing on the cake." The Volkswagen up! was Falken's chosen car to giveaway as its Sincera SN831A 165/70R14 81 ttyres are the standard factory fit on the model. Supplying tyres for the up! marked the start of a growing relationship between Falken and Volkswagen, with further cars across the VW range to be fitted with Falken tyres as standard.